Chichester’s juniors again found the going tough in division one of the National Youth Development League at a blustery Poole. The club were not helped by the clash with schools events which have dominated the Sussex scene for the past two weeks – but hopefully the squad will return to full strength in time for the final match in this league in July. However a squad of 25 athletes made up for their lack of numbers with a host of personal best performances in conditions which were not always helpful to the athletes. Despite having been on Sussex inter-county duty the previous day, Millie Grant summoned up the energy for yet another shot putt victory with a 9.45 winning throw, backed up with a B string second place for Maya Solly. The pair had already teamed up for good points in the hammer and to cap an excellent throws demonstration, the club’s effort in the discus was equally as good with Solly leading the way. A squad of 25 athletes made up for their lack of numbers with a host of personal best performances. Skye Sadler was impressive in the pole vault after equaling her all time best of 2m. Twin sister Maisie was unlucky to narrowly fail at 1.70. On the track Fleur Hollyer battled well against high-quality opposition in the sprints where all A string runners recorded 13.5sec or below in the 100m. Nicole Boltwood and Maddie Byers made a good pairing in the 800m as did twins Isobel and Eva Buckler in the 1500m, while Emily Weymouth teamed up with Boltwood in the 300m with the pair and the Buckler twins in action right at the end of the match in the demanding 4x300m relay. For the boys Ollie Beach had been in action the day before at the K2 Stadium in Crawley and had been put through his paces by ex-GB international Mike Winch at a coaching session in Brighton that morning. But this did not prevent Beech from nearly beating his PB in the 300m and showing his versatility with a 1.50m clearance in the high jump in his first time in club competition. Fellow thrower Sam Spiby scored well in the hammer and shot and easily won a good javelin competition with a throw of 34.52m, about three metres short of his best a week earlier in the Sussex schools event but a fine distance in the conditions. Also on form was Archie Sadler who won the pole vault competition with another equal PB of 2.20m. Sadler had enough energy to team up with Joe McLarnon for the 1500m with Mclarnon under 4.45, a good time in view of the increasing strength of the wind later in the programme. Oscar Rothwell and Gabryel White made a good pairing in the 800m as well as combining well in a high-class long jump with several athletes over the five-metre mark. Beach, White Sadler and Rothwell had the energy to tackle the 4x300m relay to cap a good showing all round from the small six-man under-15 boys’ squad. Just eight athletes were available but all put in a fine show against the cream of athletes from Surrey, Dorset and Hampshire. Tilly Russell-Stoneham led from the front for the girls with a new best of 13.4sec in the hurdles as well as a hard fought 1200m and a competitive high jump with Alice Waterworth. Elsewhere on the track Lucy Hollyer and Waterworth battled over 100m and 800m respectively with the pair scoring extra points towards the club’s total in the long jump. In the boys’ events Fionn O’Murchu broke through the five-minute barrier for the 1500m with Max Sydenham in support while the pairing of Barney Mclarnon teamed up well over 800m. In the field O’Murchu and Arthur Dearlove both achieved personal bests in the shot with O’Murchu 7.92 for runners-up spot in the A string, and the pair then went on to pair up in the high jump with both athletes clearing a respectable 1 metre 20. Overall the performances augur well for the final fixture at Kingston next month when Chichester will be aiming to have their best team result of the season. Chichester Runners kept up their remarkable record of having at least two finishing teams in the iconic 100-mile South Downs Relay since the event began in 1991. Over nearly 30 years, Chichester’s multi-terrain seniors have battled through driving rain as well as scorching heat and had to contend with underfoot conditions ranging from bone hard to ankle deep mud. This year the athletes were greeted with a fine day once the early-morning mist and cloud had dispersed, making navigation over the opening stages from Beachy Head a test of good map reading as well as fast running. Both the A and B teams acquitted themselves well, finishing just over an hour apart. There was history made for the club as Lucy Thraves had the honour of being Chichester’s first female athlete selected for the A team. She more than played her part and was joined by Keith Akerman, Charles Rodmell, Seth Wise, Graham Woodward and Graham Timson. With each athlete covering three stages totaling an average of 17 miles during the day, the team crossed the finishing line 11 hours and 49 minutes after setting off from the Eastbourne start. Opting for a slightly earlier start, Chichester’s B team finished barely 20 minutes later after a running time of 12.54. 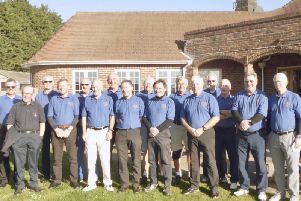 Their team comprised Jason Boswell, Ben Ritchie, John Bullard, David Knight, Ric Pullen and Michael Ridley. The club’s record time was in 1996 when the A team romped home in 10.11 with the B team breaking 11..29.59. Very few clubs among the 100 plus who have lined up have gone faster in the history of the race with Brighton & Hove holding the record of 9.55.02 set in 2002 and a Stubbington Green team including international Andy Vernon just outside ten hours. In a hard-fought inter-county match at Crawley on Saturday, athletes from Surrey, Kent, Sussex and Hampshire had a final opportunity to impress their respective county selectors to make their squad for the English schools. Chichester’s Ollie Beach was delighted to improve his best ever discus throw by two metres to record 38.40m but had to settle for fourth place on the day as three of the UK top six were also in action. In fact it proved to be a field event bonanza for local athletes with Seaford College pairing of Rupert Blackwell and Joe Spiby in action in the javelin and discus in the intermediate age group. There were marks of 50.91 for Blackwell in the javelin and 32.42 for Spiby in the discus. Lucie Munday improved her best to 26.45 in the girls’ intermediate discus while juniors Millie Grant and Brooklyn Saunter-Smith threw 9.21 and 8.85 in the shot. On the track Max Lambkin was just below his season’s best in the intermediate boys’ 200m but a 24.07 clocking showed great consistency. One Chichester athlete competing for Hampshire, Liam Dunne, had a third place in the intermediate boys’ 1500m once again in a tactical race but was rewarded with a call-up into the Hampshire English schools squad, having achieved the qualifying standard with a 4.04.78 clocking at an open meeting earlier in the season.